We’d love your help. Let us know what’s wrong with this preview of Grave Danger by Katy Lee. To ask other readers questions about Grave Danger, please sign up. Grave Danger is a follow up book to Warning Signs. I have read both and while I think the second book can be read alone it's always best to read the first as well. Grave Danger was a much better read in my opinion. I thought the characters were better developed and the story line seemed to flow in a more suspenseful way. Lydia was my favorite character and I really enjoyed getting into her mind throughout the story. While this is a small book it holds a well developed story. I recommend to those Grave Danger is a follow up book to Warning Signs. I have read both and while I think the second book can be read alone it's always best to read the first as well. Grave Danger was a much better read in my opinion. I thought the characters were better developed and the story line seemed to flow in a more suspenseful way. Lydia was my favorite character and I really enjoyed getting into her mind throughout the story. While this is a small book it holds a well developed story. I recommend to those who enjoy suspense and a touch of romance. Look for it in stores May 6, 2014! "I received this book from the author for free in exchange for an honest review-thank you!" I love an intriguing mystery; I love an exciting thriller; I love a tender romance. But it’s not often you find all three masterfully woven together on the pages bound within the same book cover. Grave Danger kept me on the edge of my seat. You know how some novels just have one really exciting point? In Grave Danger there were numerous points of suspense. Besides the gripping story line, I really enjoyed the characterization presented in the book. I’ve observed by reading her other books as wel I love an intriguing mystery; I love an exciting thriller; I love a tender romance. But it’s not often you find all three masterfully woven together on the pages bound within the same book cover. Grave Danger kept me on the edge of my seat. You know how some novels just have one really exciting point? In Grave Danger there were numerous points of suspense. Besides the gripping story line, I really enjoyed the characterization presented in the book. I’ve observed by reading her other books as well that Ms. Lee really has a knack for building her characters. I love that she doesn’t tell you all there is to know about a character the moment you meet them in the story. Instead, she allows each character to slowly reveal a little bit more about his/herself as the story unfolds. I love this slow connection with each character; it really allows you to become vested in each person’s life. Even deeper than the captivating story line and interesting characters are the themes that are woven into the tale. There is the theme of redemption as one character’s walls are slowly chipped away. And my favorite message I got from the story was the importance of doing what is right, even if there is a price to pay. One last note I want to mention is regarding the setting of this book. I enjoy the fact that the story takes place in the same place as Ms. Lee’s other book Warning Signs. In fact, some of the characters from Warning Signs also make an appearance. It’s a wonderful feeling of familiarity for a reader who has read the first book; however, past characters are not so deeply involved that it is necessary to have read Warning Signs. All in all, Grave Danger is an exciting, fast-paced story but one that also slows down enough to convey an important message. It was an easy read because it was so engaging, and I felt a better, more positive person for having read it! Before reading Katy Lee, I never read inspirational book, but I love this author's stories. Book two in the Stepping Stones series, Grave Danger, did not disappoint. This is a book for those looking for a great suspense without all the blood, gore and cruelty that takes place in a lot of thrillers. Don't get me wrong, I love reading thrillers too (Lisa Gardner- you are a master! ), but there are times I want to read and still be comfortable turning out the lights to sleep. Okay, most of the time. Before reading Katy Lee, I never read inspirational book, but I love this author's stories. Book two in the Stepping Stones series, Grave Danger, did not disappoint. This is a book for those looking for a great suspense without all the blood, gore and cruelty that takes place in a lot of thrillers. Don't get me wrong, I love reading thrillers too (Lisa Gardner- you are a master! ), but there are times I want to read and still be comfortable turning out the lights to sleep. Okay, most of the time. Katy's books are perfect in that she delivers a great suspense with page turning intrigue and leaves you guessing as to "who-dun-it". She's not afraid to throw her characters twists or put them in danger either. Another thing I love about these books is they deliver a good message without beating you over the head. SO good!! One of the best I've read! Wesley's attitude got on my nerves at times but I've got to appreciate a book that has me feeling every emotion! Grave Danger was a really good LIS novel. Having read "Warning Signs" last year, it was neat to see Miranda and Owen in this story, too. I really liked Lydia, the main female character. Her profession (forensic anthropologist) was intriguing. The mystery was great and there were several twists. Overall, a good romantic suspense novel. I really enjoyed the last half, since it felt more intense/suspenseful, but the beginning was interesting, too. If you like Love Inspired Suspense novels, I recommend Grave Danger. 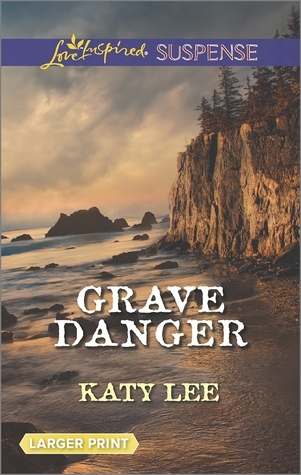 Grave Danger by Katy Lee is a wonderful and moving Inspirational suspense novel. Set on Stepping Stones Island in Maine (a setting first depicted in Warning Signs), the story revolves around the discovery of a human skull by the Island's sheriff, Wesley Grant. When a forensic anthropologist, Lydia Muir, shows up to investigate, the suspense kicks into high gear. Lydia, who is working in the shadow of her brilliant father, has to walk a fine line between her professional obligations and her moral compass. When she discovers a rare ruby buried with the human remains, fingers start pointing in the sheriff's direction since the gem is linked with his ex fiancée, Jenny. Katy Lee's latest installment in her Stepping Stone island series kept me turning the page until I finished it. I sat down to read a chapter and a couple of hours later, I finished the book. The mystery was compelling and the characters pulled me along in their action. The book had a nice balance of the mystery/suspense along with the growth of the romance between the two characters. Forensic anthropologist Lydia Muir, daughter of a famous anthropologist, is sent to Stepping Stone Island to inves Katy Lee's latest installment in her Stepping Stone island series kept me turning the page until I finished it. I sat down to read a chapter and a couple of hours later, I finished the book. The mystery was compelling and the characters pulled me along in their action. The book had a nice balance of the mystery/suspense along with the growth of the romance between the two characters. Forensic anthropologist Lydia Muir, daughter of a famous anthropologist, is sent to Stepping Stone Island to investigate a set of bones buried on the beach. She has a lot at stake in this assignment, including a promotion and a boss who doesn't really respect her. The Sheriff, Wesley Grant promised to protect his island, the people who stood by him in tough times. A body is not the way to protect them. Past and present intersect seamlessly in this story, weaving strong plot and great characters. I bought this book. It was nominated in the romantic suspense category in 2015 for a RITA award and edited by my current Loved Inspired editor. Since I'm new to Harlequin as an author-- I wanted to see what kind of writing/story line attracted both my editor and an awards nomination nod. Overall, enjoyable story line. Feisty heroine who has an intriguing job. Loved the small town island setting. 5: Loved it. Set all books aside to read this one. 4. Really liked it. Went back to it every couple of days. 3. Liked it-- but was okay setting it aside for a week or more. 2. Problematic for some reason as listed. Doesn't mean I don't love the author as a person. In Grave Danger, Katy has created one of my favorite book couples. I thoroughly enjoyed the verbal sparring between Lydia and Wesley. You truly feel like they are perfect together. One of my favorite lines was when she thought if she had a braid, he would be pulling on it. Good mystery where I don't think you'll guess the ending. I was thrilled that Miriam played a small role in this book too. Grave Danger has it all; witty dialogue, tension between the characters and suspense. You can see my ful In Grave Danger, Katy has created one of my favorite book couples. I thoroughly enjoyed the verbal sparring between Lydia and Wesley. You truly feel like they are perfect together. One of my favorite lines was when she thought if she had a braid, he would be pulling on it. Good mystery where I don't think you'll guess the ending. I was thrilled that Miriam played a small role in this book too. Grave Danger has it all; witty dialogue, tension between the characters and suspense. Grave Danger is definitely a "read in the day time" book!!! Great story filled with suspense and unexpected turns throughout....Exciting surprise ending..awesome romance story about trust, forgiveness and peace when walking with God and doing His will. Katy Lee is a riveting inspirational Christian writer and I highly recommend this book to all that love a good suspense novel. Grave Danger by Katy Lee was a excellent book. If you want suspense, intrigue, trust, mystery, and romance you HAVE to read this book. I will be rereading it. I did not realize it was a Stepping Stones Island series. It is not written on the cover any place. I did not read the first book. If I get the chance I will. I should have hated this book; it had all the things i dislike - overly "preachy," a wimpy female protagonist, issues easily resolved if persons only talked to each other - but it was so well written and the story exciting enough that, for this book only, I was able to put these aside. This was an interesting read; part-suspense, part-romance. A skeleton brings Dr. Linda Muir and Sheriff Wesley Grant together. Both are hurting people. Grant surrounds himself with a hard shell because his mother sent him away when she knew she had only a few months to live to protect him and because his last girlfriend left him for another man--one closer to her financial station in life. Muir feels inadequate compared to her well known father and is trying to gain the respect of her boss. Does This was an interesting read; part-suspense, part-romance. A skeleton brings Dr. Linda Muir and Sheriff Wesley Grant together. Both are hurting people. Grant surrounds himself with a hard shell because his mother sent him away when she knew she had only a few months to live to protect him and because his last girlfriend left him for another man--one closer to her financial station in life. Muir feels inadequate compared to her well known father and is trying to gain the respect of her boss. Does she want the promotion or the truth? When the skeleton yields a ruby that Grant recognizes as one his girlfriend wore, the investigation leads back to his past and into danger. Grant also struggles with wanting to protect Muir from danger--and failing several times--which keeps him pushing her away. When he finally wakes up to this fault in himself, Muir withholds the forgiveness he asks for, and it seems they won't get past their hang ups to live happily ever after. Twist and turns like you wouldn't believe. I just couldn't put down. When Dr. Lydia Muir a forensic anthropologist comes to Stepping Stone to help identify bones that have been found on the island. It soons becomes more to it, and Lydia finds herself questioning things. She knows she can handle things. Only one particular Sheriff doesn't think so. When she meets Sheriff Wesley Grant he wants her gone fast. It doesn't go that way. Wesley has a job to do, and now with Dr. Lydia Muir on his island things aren't going to well. The bones that have been found are not what everyone expects. It leads to a lot of unanswered questions. See what happens. Highly recommend. An easy, well-paced read with several twists and turns. Even if the romantic ending is predictable, the mystery is not, and it keeps you guessing throughout. This book was AMAZING! Every turn was exciting, and the characters felt so real. There were times the suspense was so thrilling, I had to get up and walk around a little bit because I was breathing really hard (as if I was running with the characters themselves!). I enjoy a book that makes me feel like I'm a part of the story, and this was just that! I loved Katy Lee's ability to make me love/hate a character. She does such a wonderful job giving distaste or favor to a character using the descri This book was AMAZING! Every turn was exciting, and the characters felt so real. There were times the suspense was so thrilling, I had to get up and walk around a little bit because I was breathing really hard (as if I was running with the characters themselves!). I enjoy a book that makes me feel like I'm a part of the story, and this was just that! Ok...but not one of my favorites of "Love Inspired" suspense. Good, short read filled with suspense and mystery. Great Christian read.